It is clear that inflammation is linked to heart disease, and that one of the body’s most common source of inflammation is periodontal (gum) disease. 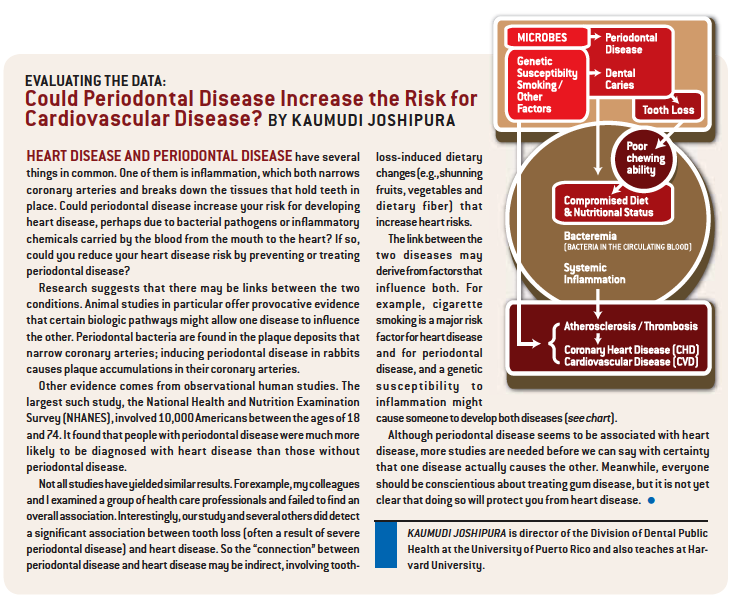 Does poor oral health contribute to heart disease risk? Inflammation, a central player of atherosclerosis, occurs when white blood cells, the body’s first line of defense against infection, invade and become active in tissue. Article by Peter Libby, Scientific American “Oral and Whole Body Health”, pages 12-16. HEART DISEASE AND PERIODONTAL DISEASE have several things in common. One of them is infl ammation, which both narrows coronary arteries and breaks down the tissues that hold teeth in place. Could periodontal disease increase your risk for developing heart disease, perhaps due to bacterial pathogens or infl ammatory chemicals carried by the blood from the mouth to the heart? If so, could you reduce your heart disease risk by preventing or treating periodontal disease? Research suggests that there may be links between the two conditions. Animal studies in particular offer provocative evidence that certain biologic pathways might allow one disease to infl uence the other. Periodontal bacteria are found in the plaque deposits that narrow coronary arteries; inducing periodontal disease in rabbits causes plaque accumulations in their coronary arteries. Other evidence comes from observational human studies. The largest such study, the National Health and Nutrition Examination Survey (NHANES), involved 10,000 Americans between the ages of 18 and 74. It found that people with periodontal disease were much more likely to be diagnosed with heart disease than those without periodontal disease. Not all studies have yielded similar results. For example, my colleagues and I examined a group of health care professionals and failed to fi nd an overall association. Interestingly, our study and several others did detect a signifi cant association between tooth loss (often a result of severe periodontal disease) and heart disease. So the “connection” between periodontal disease and heart disease may be indirect, involving tooth loss- induced dietary changes (e.g., shunning fruits, vegetables and dietary fiber) that increase heart risks. The link between the two diseases may derive from factors that influence both. 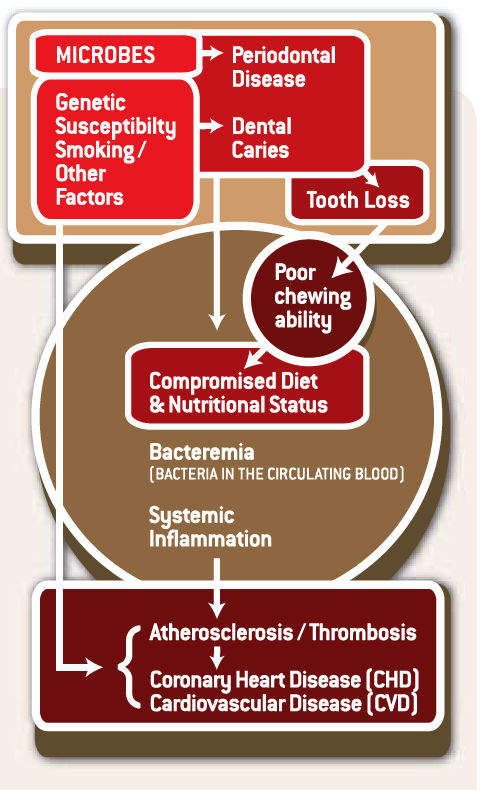 For example, cigarette smoking is a major risk factor for heart disease and for periodontal disease, and a genetic susceptibility to inflammation might cause someone to develop both diseases (see chart). Although periodontal disease seems to be associated with heart disease, more studies are needed before we can say with certainty that one disease actually causes the other. Meanwhile, everyone should be conscientious about treating gum disease, but it is not yet clear that doing so will protect you from heart disease.